Harry Kane (£12.6m) limped down the tunnel in pain during Tuesday night’s Champions League quarter-final between Tottenham and Man City, throwing a huge spanner in the works of many Wildcards. Managers were already debating whether to put faith in Watford before their cup final, whether to double-up on Liverpool assets or whether to go heavy on a Man City side fighting on so many fronts. Now the midfield congestion increases with the desire to cover Spurs for their home meeting with Huddersfield. The TSZ community enjoyed Eden Hazard’s (£11.1m) majestic performance against West Ham on Monday, although Mauricio Sarri’s post-match comments seem to suggest that we’re living a long goodbye for this FPL legend. If the Belgian does indeed head to Real Madrid, he certainly can’t be accused of downing tools and having his mind elsewhere. 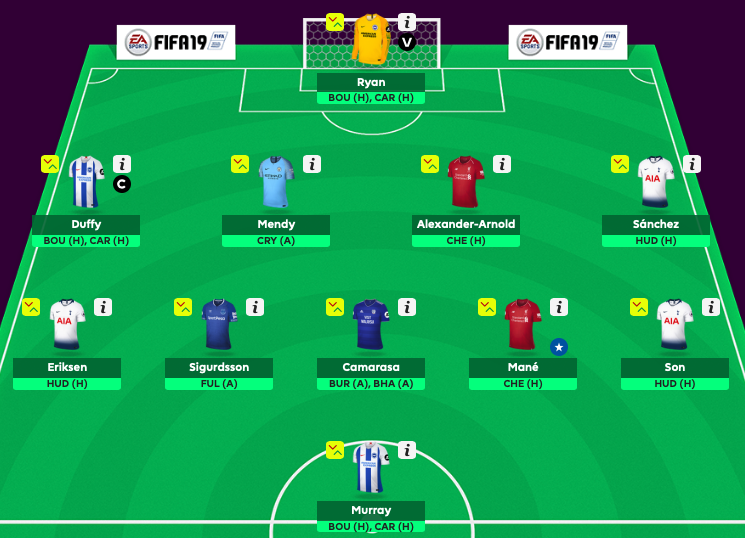 Hazard was highly-captained in Gameweek 32, although some were delighted that the slightly left-field armband choice of Jamie Vardy (£9.2m) also paid off – he also scored 16 points. Vardy’s brace against Huddersfield made it eight goals from eight games for the Leicester man, forcing a dilemma amongst his ownership – ahead of Double Gameweek 35, do you stick with an in-form striker who only plays once? 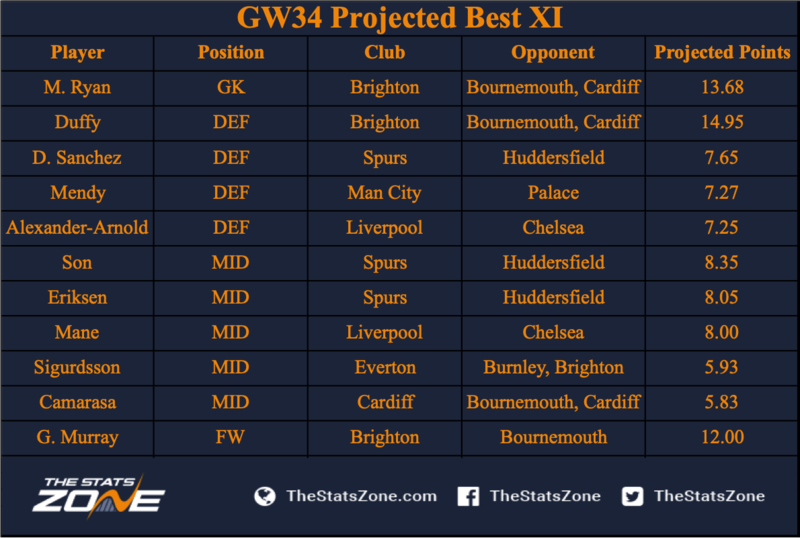 Additionally, Gameweek 34 provides two games for Brighton and Cardiff. 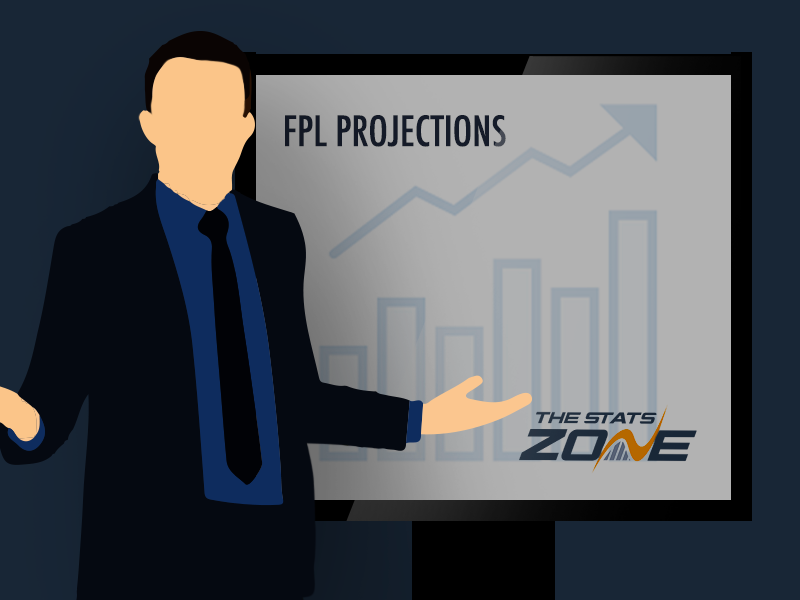 Chris Hughton’s side were also one of the many teams to double in Gameweek 32, when the last projections team was calculated. It was a high-scoring week across the board but the algorithm’s score of 85 was still enough to beat the global average of 73. Raheem Sterling (£11.5m) was made captain but blanked in one game whilst not playing in the other. Hazard preceded his West Ham haul with 14 points against Brighton, alongside 11 from Son Heung-min (£8.6m) and a sense of ‘what if’ around Sergio Aguero (£11.7m), who amassed ten points before a 56th minute injury in Man City’s first game. Defensive teammate Aymeric Laporte (£6.0m) brought in a fantastic 18 from two clean sheets, one assist and three bonus points. Like last time, Mathew Ryan (£4.4m) gets the goalkeeping role. Brighton are the only side to play twice in both Gameweek 34 and Gameweek 35, with the first week’s fixtures being particularly attractive. The Seagulls can’t afford to be at the beach as they’ve swooped into the relegation battle. Home games with Bournemouth and Cardiff present a great opportunity to pull themselves towards safety, although their total of six clean sheets have only been worsened by three other teams. At least Shane Duffy (£4.7m) offers goal potential. Five have been scored this season, more than all other defenders. With two matches, there’s a strong chance he’ll score either a sixth or grab a third assist, which is why the algorithm has trusted him with this week’s captaincy. Amongst the anticipated Man City rotation, it’s interesting to see the return of Benjamin Mendy (£6.1m) from the knee injury which kept him out of action since 11th November. He certainly won’t be thrown into every game but the trip to Crystal Palace is placed between both legs of the Champions League quarter final and this, combined with the new injury to Oleksandr Zinchenko (£4.7m), enables him to play more minutes than what Pep Guardiola initially intended. He assisted six times in nine games. Davinson Sanchez (£5.8m) was an unused substitute against Man City and is a late addition to the line-up, with Kane’s injury making it a 4-5-1 formation. Many see Trent Alexander-Arnold (£5.5m) as a great alternative to Andrew Robertson (£6.8m), with the right-back far cheaper and just as frequent with assists. He added another one at Southampton and set up Roberto Firmino’s (£9.3m) second goal against Porto. The only concern is the return of Joe Gomez (£4.8m) to Liverpool’s bench, as the versatile youngster is now fit and seeking the same match practice as Mendy. It’s gone slightly quiet for Sadio Mane (£10.1m), who has followed nine goals in nine Premier League matches with two consecutive blanks. The spotlight is currently on Firmino and Salah - who ended his barren streak with a goal on Friday night - but the algorithm still predicts Mane will produce the goods against Chelsea, despite never scoring against them in a Liverpool shirt. None of the four English quarter-finalists are in a position to prioritise their Champions League conquests, with the title race and battle for a top-four finish being incredibly tight. At Spurs, will Christian Eriksen (£9.2m) and Son be tired? Probably. Will they start next Wednesday’s return leg at the Etihad Stadium? Definitely. Yet they have to start on Saturday because they can’t risk dropping vital points, even if their opponents are lowly Huddersfield. Eriksen usually avoids rotation and is on most set pieces, though it remains to be seen whether the Dane takes over Kane’s penalty duties. He christened the new Tottenham Hotspur Stadium with a goal and assist against Crystal Palace, setting up Son for the arena’s first ever strike. Curiously, Spurs seem to cope well without their star striker. Since the start of the 2014/15 season, they have 1.92 points-per-game and 1.97 goals-per-game from Kane’s 157 appearances, yet the 27 without him yielded 2.07 ppg and 1.7 gpg. Even then, the four Kane-less matches from January and February brought four wins and eight goals – three of which came from Son. Of course, there’s a slight chance that Fernando Llorente (£5.1m) is given the go-ahead, considering he also scored in one of those, but Son is a top contender for FPL points. Also likely to be on pens. Completing the midfield, we first go to Craven Cottage. Already-relegated Fulham have five games to avoid conceding 13 more goals, which would tie them with Derby as the team to concede the most in a 38-game Premier League season. Gylfi Sigurdsson (£7.3m) aims to continue his scoring run against the Cottagers, with his brace from September’s 3-0 win making it four goals from three meetings. The fifth midfielder is cheap enabler Victor Camarasa (£4.5m), playing twice this week in very winnable games for Cardiff against Burnley and Brighton. He’s on penalties and free kicks, with recent goals against West Ham and Chelsea taking him up to five this season. Alone up front is Glenn Murray (£6.3m). With Kane injured, Firmino against Chelsea and Aguero playing on Guardiola’s ‘Rotation Carousel’, the Brighton man is there because of the mini double gameweek. Whether he starts against both Bournemouth and Cardiff is another question, especially with another double in Gameweek 35. Florin Andone (£5.0m) rivals him for the role but his starts have dried up of late. Because Murray got the nod for a Wembley FA Cup semi-final, he’ll be expected to do so for these two big games. Hugo Lloris (£5.4m) is expected to follow his Aguero penalty save with a clean sheet against Huddersfield and Alisson (£5.9m) is also backed, despite facing Hazard. To survive their brutal schedule, step one for Man City is to be defensively robust. Only one goal has been conceded in their last seven games, strengthening the case for Ederson and Laporte to deliver at Crystal Palace. Neil Etheridge (£4.7m), Martin Montoya (£4.3m) and Lewis Dunk (£4.4m) are on double-duty, with Liverpool’s Robertson fresh from missing the Porto match through suspension. Beyond the optimum team’s five midfielders there’s not much else to pick from, with three Brighton players appearing. Salah scored his first goal in seven games and his 35% ownership will all hope this has removed the self-doubt that was emerging. Between Gameweeks 25 and 33, he has seen a per-game rise in penalty box touches (9.8), total shots (3.9) and shots in the box (2.2) but they weren’t as good, with his xG dropping from 0.6 to 0.3. More touches and shots but of a lesser quality suggests that he’s lost the confidence of shooting first time, taken more touches and then had panic shots out of desperation. Against Chelsea, we’ll find out whether Salah is truly back. At Arsenal, meanwhile, Alexandre Lacazette (£9.4m) seems to be the undisputed number one striker, as Pierre-Emerick Aubameyang (£10.9m) has started four of their last six games on the bench. Lacazette has the most assists of all strikers (11) whilst still contributing 13 goals himself. He faces Watford away, then Crystal Palace and Wolves during Double Gameweek 35.